Definition at line 159 of file _cmath.h. 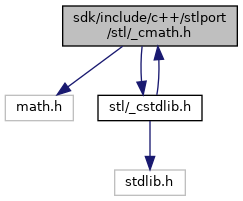 rough characterization of compiler and native C library For the compiler, it can either support long double or not. If it doesn't, the macro _STLP_NO_LONG_DOUBLE is not defined and we don't define any long double overloads. For the native C library the question is whether it has variants with an 'f' suffix (for float as opposed to double) or an 'l' suffix (for long double). If the float variants are missing, _STLP_NO_VENDOR_MATH_F is defined, when the long double variants are missing, _STLP_NO_VENDOR_MATH_L is defined. Of course the latter doesn't make sense anyway when the compiler already has no long double support. Those two traits determine a) which overloads get defined and b) how they are defined. Definition at line 231 of file _cmath.h. Definition at line 235 of file _cmath.h. Definition at line 247 of file _cmath.h. Definition at line 239 of file _cmath.h. Definition at line 243 of file _cmath.h. Definition at line 163 of file _cmath.h. Definition at line 165 of file _cmath.h. Definition at line 168 of file _cmath.h. Definition at line 194 of file _cmath.h. Definition at line 191 of file _cmath.h. Definition at line 201 of file _cmath.h. Definition at line 167 of file _cmath.h. macros to define math functions These macros (having an X somewhere in the name) forward to the C library's double functions but cast the arguments and return values to the given type. Definition at line 188 of file _cmath.h. Definition at line 424 of file _cmath.h. Definition at line 458 of file _cmath.h. Referenced by _CIpow(), detectChange(), device_clear_render_targets(), do_rva(), DSOUND_RecalcVolPan(), format_float(), format_value(), get_hwnd_from_ifiledialog(), gl_color_shade_vertices(), gl_color_shade_vertices_fast(), gl_compute_material_shine_table(), gl_compute_spot_exp_table(), gl_index_shade_vertices(), gl_pow(), CMathTest::import_checks(), init_layer12_table(), init_layer3(), init_layer3_gainpow2(), JSGlobal_parseFloat(), Math_pow(), number_to_str(), Number_toString(), parse_decimal(), parse_numeric_literal(), pow(), powl(), pres_exp(), ProcessPlayingNotes(), rpn_cbrt(), rpn_exp10(), rpn_exp3(), rpn_pow_f(), rpn_s_ex(), rpn_shl_f(), rpn_shr_f(), rpn_sqr_f(), str_to_number(), test_customize(), test_instantiation(), test_SetSite(), TIFFCIELabToRGBInit(), TIFFDefaultTransferFunction(), ValarrayTest::transcendentals(), TRIO_ARGS2(), VarPow(), VarR8Pow(), VarR8Round(), VarRound(), wcstod(), and xsltFormatNumberConversion(). Definition at line 465 of file _cmath.h. Definition at line 469 of file _cmath.h.